Keep your wine with Travelon Wine Travel Case | UNIGLOBE Direct Travel Ltd. If you like bringing wines during your trip, this is for you! You demanded it and Travelon delivered; an affordable, lightweight wine carrier with all the protection you need for transporting your wine investment. 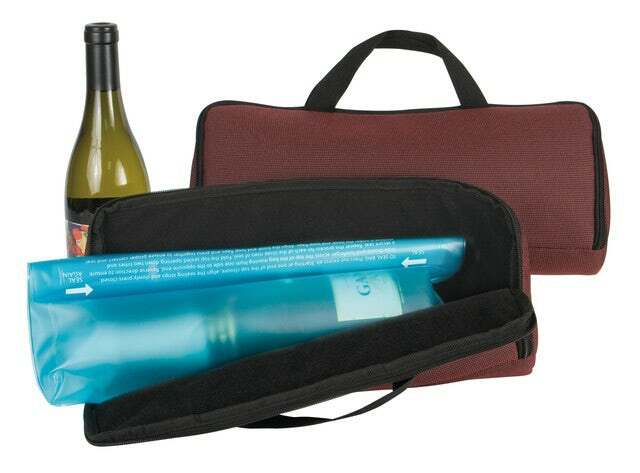 The well-padded Travelon Wine Travel Case safely carries two bottles of wine within two leak-proof pouches. Pack the case within your bundle of clothing and in the middle of your bag for added protection in your checked bag. Perfect for trips, picnics, and outdoor concerts, the Travelon Wine Carrier is much more affordable than other options out there and protects what many regard as an investment - your fine Cabernets and Merlots. The piece includes carry handles and a shoulder strap. Contact us now and get your Travelon Wine Travel Case!